In 1958, the United States military evaluated two prototypes being considered as a new standard issue infantry rifle. One of the requirements identified as centrally important for the new rifle was reduced weight. A lightweight rifle would allow soldiers to carry more equipment, supplies, and ammunition. Just as the new designs were being evaluated, the U.S. Army’s Continental Army Command compiled and eventually published two combat studies from both world wars to help shape the requirements for the new rifle. One of the more compelling statistics from this study revealed that 2/3 of soldiers in combat never fired their weapons and that the vast majority of firefights occurred at close range and commenced as “surprise” encounters, especially in a tropical environments. Assuming that the low-intensity conflict South East Asia would continue to escalate, the Continental Army Command recognized that a lightweight rifle firing a small caliber, high velocity cartridge would be the ideal weapon for the coming jungle war. Of the two prototypes submitted to the U.S. Army’s Infantry Board for evaluation, the ArmaLite AR15, which was based on an earlier design by Eugene M. Stoner stood out early on as the better gun. In 1961, General Curtis Emerson LeMay is made the fifth Chief of Staff of the United States Air Force and, shortly thereafter, he placed an order for 80,000 AR15’s for U.S. Air Force security forces. However, the President John F. Kennedy’s administration refused the order on the grounds that it the logistical challenges associated with having two different rifle calibers – 7.62x51mm and 5.56x45mm – in use by the U.S. military at the same time would be too great. As the conflict in South East Asia continued to grow, the U.S. sent 10 AR15s to Vietnam for testing and evaluation in early 1962. Soldiers using the AR15 quickly praised the rifle’s effectiveness in combat. In response, the US sent more rifles for South Vietnamese Special Forces unites. Soldiers using the weapon, again, offered unreserved praise for the stopping power of the rifle’s 5.56x45mm cartridge. Although the AR15 received great accolade for its performance in battle, what no one knew outside of the men using it was that the wounds the rifle produced were ghastly – so much so that the photographs showing these wounds remained classified until 1980. The source of the rifle’s destructive power was not so much the 55g 5.56mm bullet it fired, but the pitch of the rifle’s barrel’s rifling. The 1 in 14 twist rate of the rifling produced sufficient ballistic stability to get the bullet to a target, but on impact with that target, the bullet tended to tumble end over end. Although the 1 in 14 twist rifling produced devastating lethality, it did not produce satisfactory accuracy in cold temperatures. In July of 1963, Secretary McNamara approved the Air Force’s request to change the rifling twist to 1 in 12. The main theory being that the increased probability of a hit outweighed the higher chance of a kill resulting from that hit. As the shortcomings of the M14 rifle’s design became more thoroughly understood, more attention was shifted to the new AR15 rifle. The Kennedy Administration and other officials began to push for a “modern” rifle and the AR15 provided the clear answer. With the change to the 1 in 12 twist rate having been already made, the U.S. Air Force’s plans to adopt the AR15 began to move forward swiftly. The Army however, was still dragging its feet and looking for ways to challenge the adoption of the new rifle. 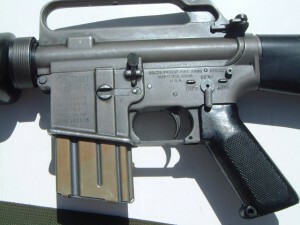 The Army insisted on the installation of a bolt closure device so that the troops would have the ability to manually close the bolt on a rifle in the event of a malfunction. Manual bolt closure had been a part of the design of every U.S. service rifle since the M1903 Springfield, and the Army was not about to give up on it now. Both the Air Force and Eugene Stoner insisted that the rifle did not require a bolt closure device and pointed out that there had been no failures in testing that would have been remedied by the addition of the device. The Air Force stood fast on the fact that the bolt closure device was unneeded while the Marine Corps and Navy sided with the Army in recognition of the device being potentially useful. By October of 1963, U.S. Secretary of Defense Robert Strange McNamara had no choice but to recognize that the service branches would not all agree on the change and that there would not be a single model of the rifle. Soon thereafter, Contract 508, which was valued at $13.5 million, was issued to Colt on November 4, 1963. 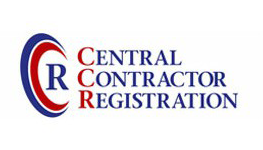 The contract was for 104,000 rifles. 85,000 rifles with the bolt closure device (forward assist) would be for delivery to the U.S. Army and U.S. Marine Corps. These were designated XM16E1 rifle (Experimental M16, change one – the addition of the forward assist). The remaining 19,000 rifles would be delivered to the Air Force and did not have the bolt closure device. They were designated as the M16. The only difference between the two models was the the bolt closure device, and the roll marked name designation on the receiver. Delivery of these rifles began in March of 1964. The Army’s rifles were delivered to elite units including Special Forces, the 101st Airborne Division, the 82nd Airborne Division and the newly formed 1st Cavalry Division. 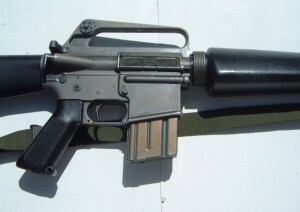 Early use in Vietnam and the 82nd Airborne Division’s use of the weapon in the Dominican Republic indicated that the design was a great success. In July 1965, General Westmoreland asked that a logistical study be conducted to evaluate the possibility of expanding the adoption of the new rifle to such an extent that it would be issued to every U.S. serviceman in Vietnam. In the Fall he advocated ordering 100,000 new rifles. The low recoil, light weight, and impressive rate of fire of the 5.56mm XM16E1 was perfect for the jungles of Vietnam. However, the quick success and immediate need for more rifles would soon lead to problems. With an increase in demand for rifles came an increase in demand for ammunition, which would ultimately cause a series of notorious failures that would plague the M16’s reputation for decades to come. Ammunition manufacturers were struggling with the requirements specified by the technical data package for the M193 cartridge (the official designation for the M16’s 5.56mm ammunition). High gas port pressures, chamber pressures, and cyclic rates of fire, along with arguments over the bullet’s shape initially led all approved ammunition manufacturers to decline bidding on the contract. However, an agreement was eventually reached and DuPont produced CR8136 powder (commonly referred to as stick or tube) and Olin Mathieson produced WC846 powder (commonly referred to as ball powder). This initially satisfied the Army by keeping with the concept of having two approved yet different powders to compensate for shortages, manufacturing problems, etc. However, in reality, DuPont could not meet consistent pressure measurements for the ammunition which resulted in the first 18 months of ammunition production using the WC846 powder almost exclusively. By September of 1965 evidence and testing clearly indicated that the WC846 powder caused a higher cyclic rate and was more prone to fouling. In fact, the 15th Memo Report on the XM16E1 system stated “the control propellant, WC846 though otherwise satisfactory, does produce quantities of fouling…sufficient to affect weapon function if the weapon is not cleaned after firing a maximum or 1,000 cartridges… that [Olin] be encouraged to modify their propellant.” However, the rifle continued to fair well in Vietnam, primarily as a result of the training that soldiers in elite units had received. In the summer of 1966, the new rifle began replacing the M14 in all U.S. Army combat arms units – soon, “everyone” would have the XM16E1 rifle. Many units received them in-country with very little attention paid to training the soldier on the care and maintenance of the new rifle. A shortage of cleaning kits, a total lack of a chamber brush, shortcomings in training, and ammunition that created fouling problems soon led to failures in combat that ultimately resulted in a Congressional Investigation, the Ichord Committee, in 1967. By late 1966/early 1967, chamber brushes, bore brushes, and a swab holder for the new 4 piece cleaning rod were on order. Maintenance cards were printed and circulated to help instruct soldiers on the care of their new rifle. While necessary, it would still take months to get these items into the field. 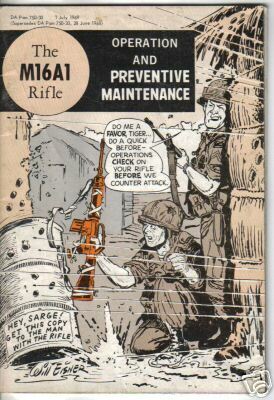 In the late 60’s, the Army turned to artist Will Eisner of Mad Magazine to help illustrate maintenance comics. Anything that could be done to help a soldier care for his rifle would be done. The XM16E1 rifle had many small changes during its development, but there were 10 primary engineering changes that took place before the reclassification of the rifle as “Standard A” and its eventual designation as the M16A1 in February of 1967. The gas tube, buffer, bolt hardness, bolt carrier key finish, firing pin retainer, bolt catch, disconnector, and flashider were all modified, and a raised fence area was added around the magazine release to help prevent hitting the release unintentionally. A chrome plated chamber would eventually be added to the revision list in May of 1967. With design improvements, a chrome chamber, reformulated powder, and proper training for soldiers in the field on the use and maintenance of the rifle, reliability improved quickly – as did morale. A testament to the legacy of the M16 series is the M16A4 currently in use the U.S. Marine Corps and the M4 Carbine in use by the US Army. 50 years after is adoption by the U.S. Military, the M16 family is still soldiering on as the longest serving US rifle.